The Nation Arboretum's wisdom in testing this for over twenty years is rewarded by superior tree form, 30 feet tall by on 15 feet wide. It has semi-pendulous, single, dark rose-pink flowers opening late in March into early April. One of the best features are red calyces which provide an interesting post-bloom ornamental color boost for a further three weeks after petal drop. 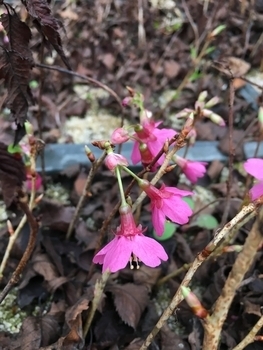 Coarse and brittle, its blackish purple foliage, soft pink flowers and tough constitution still create big demand for it in commercial jobs and inexpensive landscapes across America. A favorite in the arid, hot Southwest where it tolerates blistering summer heat. 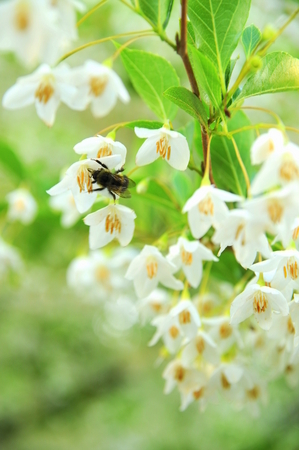 Single white flowers: offer these as an alternative to, or mixed with the pink-flowered form. Flaking bark texture, even on young trees. Although its common name indicates that it prefers moist areas, it is drought tolerant. The silver undersides of the leaves lend contrast to the upper leaf surface, prompting the species name "bicolor". 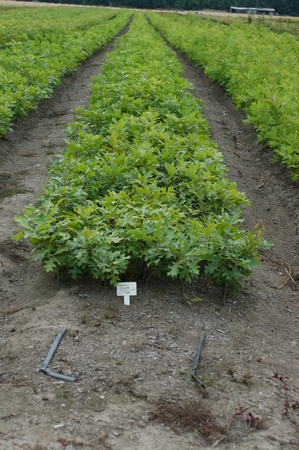 Among the easiest of the oaks to transplant, it is also hardy and has few insect or disease problems. Large tree, more tolerant of high pH soils than Pin Oak. In the wild it grows in upland areas. 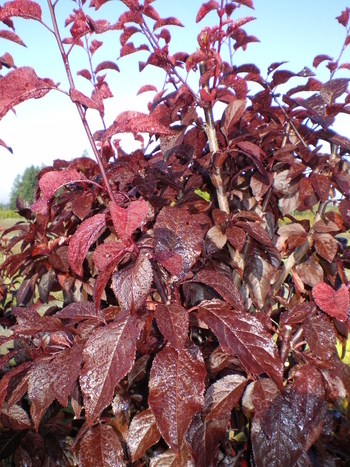 Bright red fall color, persistent leaves, and a round outline at maturity. Excellent bright maroon fall color. 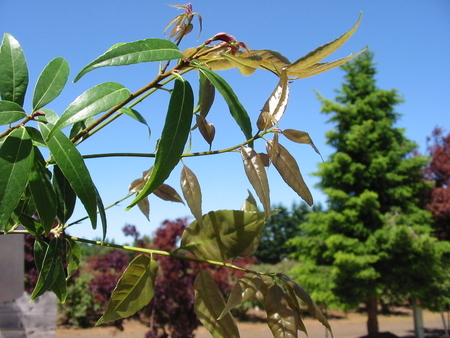 Shiny foliage, a 60-80 ft. tall tree at maturity that, unlike Q. palustris, thrives in alkaline soils. Tolerates wet or dry conditions. A handsome new selection from our friend of many years, Earl Cully. His judgment is well-respected in the industry. Forest Knight is a great street tree for new neighborhoods due to its leafy, high canopy features. It is broad spreading (to 50 feet) but the central leader is strong so it will develop fantastic symmetry over time. Mildew resistant, shiny green leaves above, silver beneath. A recent introduction of exceptional hybrid vigor - great nursery plant. Dense, uniform pyramidal crown. This is a Q. robur x macrocarpa hybrid. 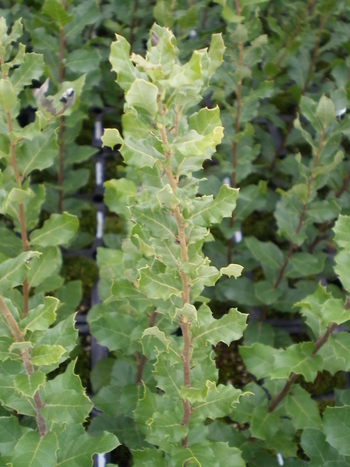 Native to upper elevations in the Davis Mountains of West Texas, this evergreen oak is widely adapted, forming shrubs where conditions are harsh - or a 40 ft. tree where more favorable. Deep dark green leaves are backed by white. 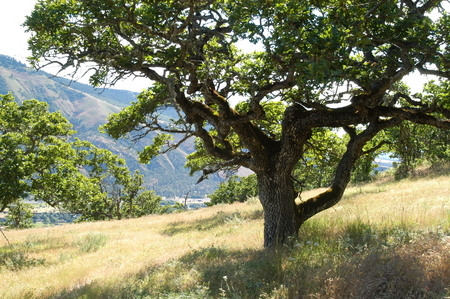 Under-utilized, this tree is adapted to grow throughout much of the mild West. One of the hardiest evergreen oaks, its natural range is from the Mediterranean to Western Pakistan. 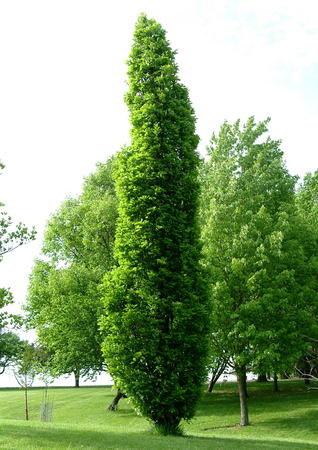 The tree becomes huge and creates deep shade with dense pendulous branching and dark foliage. As the tree grows larger, some branch thinning makes for a pleasant, airy canopy on open-growing specimens. Best host for black truffle culture. With outstanding hybrid vigor, dark green foliage that is highly resistant to powdery mildew and almost perfect branching structure Jordan Street is perfect shade tree. It has shown no sign of damage from wind or ice and is hardy to below -28F and windchill to -86F - wow that is cold. 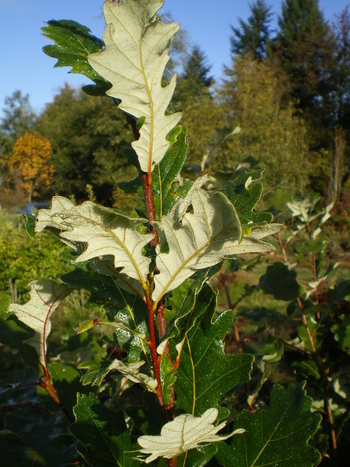 Chief among its merits is strong mildew resistance, in contrast to columnar English oak, which often gets terribly infested with this leaf disease. Strongly columnar in outline, it's 4-5 times taller than wide in outline, significantly more columnar than the similar selection, Regal Prince®. 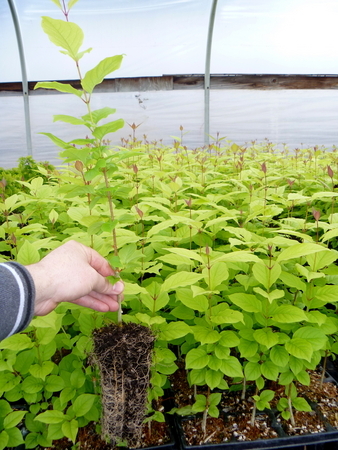 Grafted onto vigorous Q. bicolor liners with mycorrhizal roots, these have excellent survivability without significant transplant shock. Q. robur var. fastigiata x bicolor. Native across a broad range in the eastern US, it is consequently variable in leaf form, size and growth rate. Our seedlings are of Missouri source. This patriarch forest tree is best for parks and large, open landscapes. Native across a broad range in the eastern US, it is consequently variable in leaf form, size and growth rate. These seedlings are Pennsylvania source. This patriarch forest tree is best for parks and large, open landscapes. 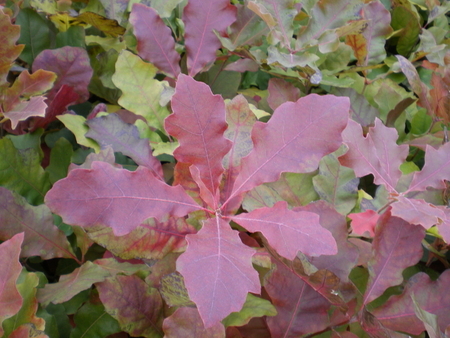 Dark green foliage with white underside, turning yellow-orange-brown in fall. The large leaves are 4-7 in. long. Bark is ashy gray. To 50 ft. tall at maturity. Hardy to 0-10°F, this is the most cold tolerant of any evergreen oak. With its slender shiny leaves and medium size (to 40 ft. normally) it has a place in many landscapes. Widely planted throughout the eastern US because it tolerates wet sites and disturbed, compacted soils. 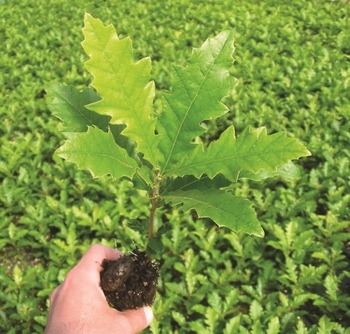 Pin Oak is sometimes seen with chlorotic foliage caused by iron deficiency in high pH soils. 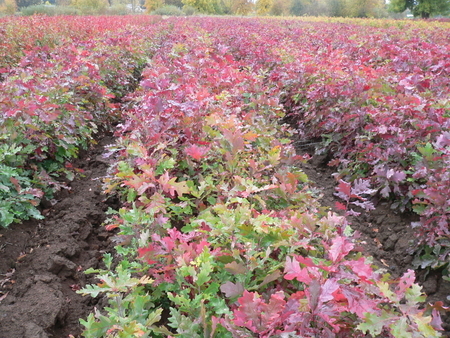 In such areas, Quercus ellipsoidalis is a superior landscape choice, better adapted to limestone soils. 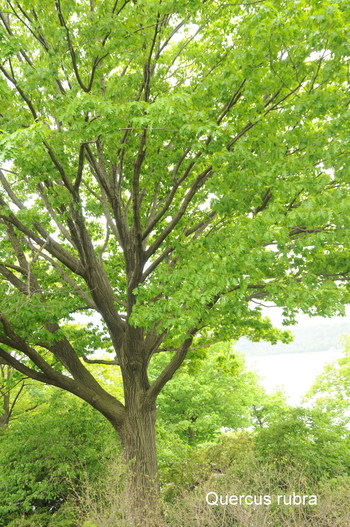 A fine -textured tree with high branches, it makes a great specimen for a lawn or along a roadside. Fall color ranges from brown to yellow to russet red. Rapid growing, this is among the best of the eastern US oaks. 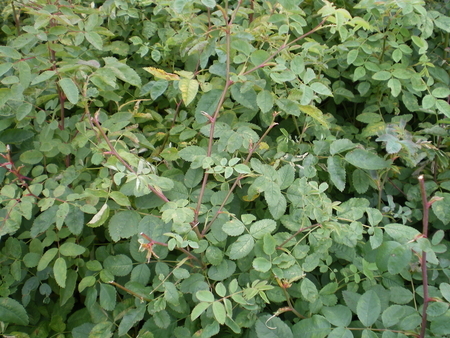 Its narrow leaves are easily cleaned up from the lawn. The small acorns, like those of the pin oak, are relished by wildlife. Also known as Basket Oak, the wood of this tree splits easily into strips of great strength. In the South it was once used to make hundreds of thousands of baskets for packing cotton from the field. Its utility in bygone generations is now eclipsed by its great ornamental beauty. Performs well even in poor, rocky soil. Handsome, glossy deep green foliage and a bold, upright, oval silhouette. Leaf undersides are white with dense, downy hairs, helping keep the leaf dry - a significant factor in its resistance to mildew, to which Columnar English oak is so susceptible. Q. robur var. fastigiata x Q. bicolor. Among the largest of the North American oaks, it grows fast and is easy to transplant. 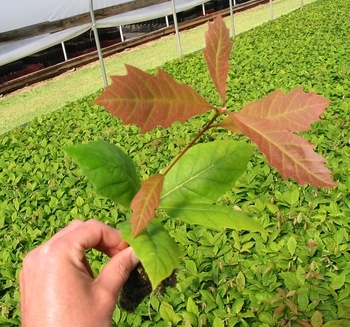 Easier to transplant than most oaks, it also grows well in soils up to pH 8.0. 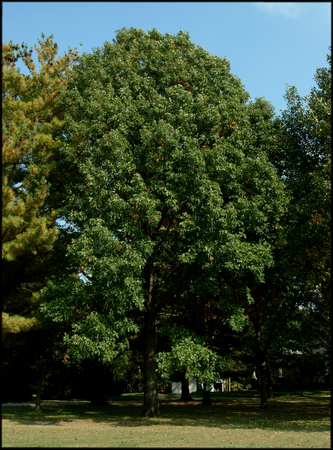 In form and growth rate it is typical of Scarlet Oak, but usually grows to only 50 ft. tall. Native range is Southwest Europe and northwest Africa, but it is completely at home in warmer regions of North America. Its corky bark can be sustainably harvested every 10 years or so. Frost sensitive, it must be grown in warm climates. 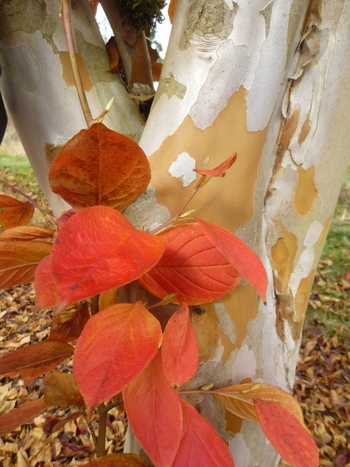 A tree of exceptional ornamental beauty for its bark and handsome foliage. 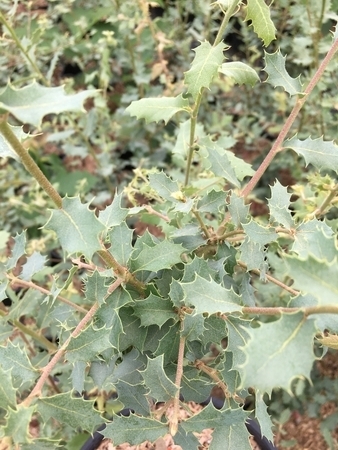 The small, prickly, holly-like leaves of 'Coconino' are silver-gray; the tree is hardy and fully evergreen in Zone 5B and below. 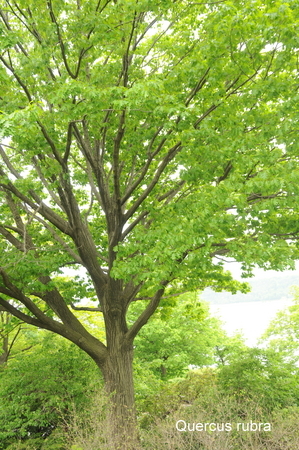 At maturity, the grafted tree should be about 20 feet tall. The silver-gray leaves and the black fissured bark of 'Coconino' make it a striking subject as either a specimen planting or in a group. It is very representative of the mixed oak/pine forests of the upper Southwest, a lovely reminder of hikes and camping trips on the Mogollon Rim in northern Arizona. Will do well across the West because of its region-adapted rootstock which is tolerant to high pH soils and arid conditions. With small, startlingly blue tinted foliage and modest stature, features not previously available commercially in an oak, Dolores River Southwest Heritage Oak™ is very desirable. The autumn change from blue to red-mahogany comes very late, November or December. 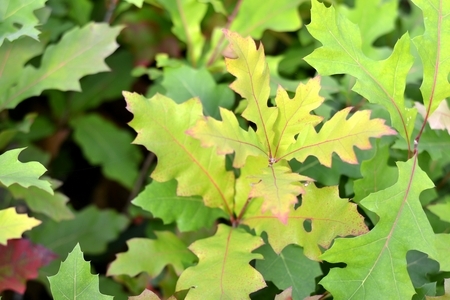 It broadens the market for small trees by reducing the shortage of oak trees which can be grown without high maintenance costs in the arid West. Appropriate for small sites, arid locations and alkaline soils which cause many oaks to suffer chlorosis because of its region-adapted rootstock. This grafted form will grow with a single stem to 15-18 feet tall, with a 15-foot spread. It could easily be grown as a low branched spreading tree. 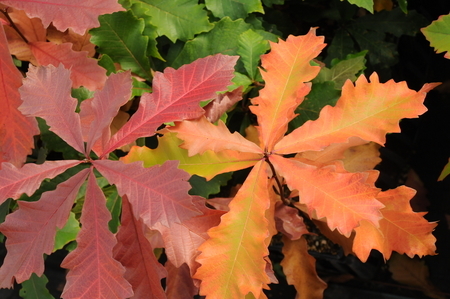 Mesa de Maya Southwest Oak™ has large blue-gray leaves which hold their color late into autumn. The foliage lacks most prickles and the tree, reaching 25 feet in height at maturity, will be a stunning contrast to most background colors. In the arid and drought-prone West and the Southwest it will thrive because of it region-adapted, high pH tolerant rootstock. This grafted form will grow with a single stem to 25 feet tall with a 20-foot spread. It could also be branched low and grown as a multi-stemmed tree, as is common to its wild sisters. 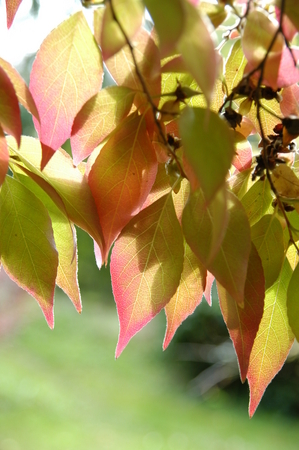 Toll Gate Canyon has attractive green, deeply lobed 4 leaves that take on a nice red hue in autumn. Except for its drought tolerance, this oak looks more like a typical white oak, albeit with pointed rather than rounded lobes because it is a multi-generational hybrid with Q gambellii. 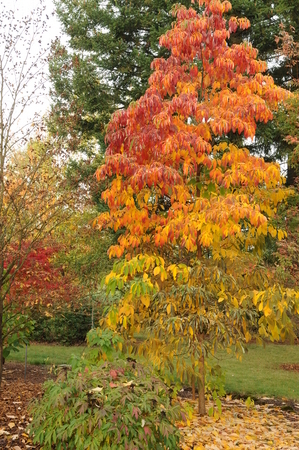 The smaller stature of ‘Toll Gate Canyon’, to 20', makes this tree applicable for nearly all spaces and landscapes in the Western US and SW Canada. It is grafted onto a highly adapted root stock which tolerates dry and alkaline soils, making it broadly adaptable to all western soils. An oak of many colors, Black Oak was named for the dark shadows on its deeply fissured bark. 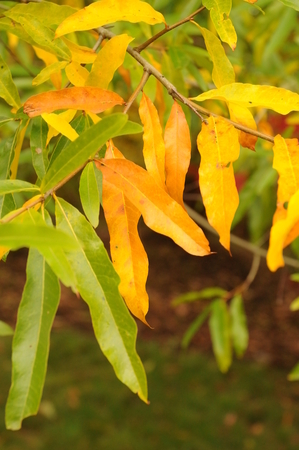 Its inner bark is bright yellow, and the foliage develops appealing autumn color. 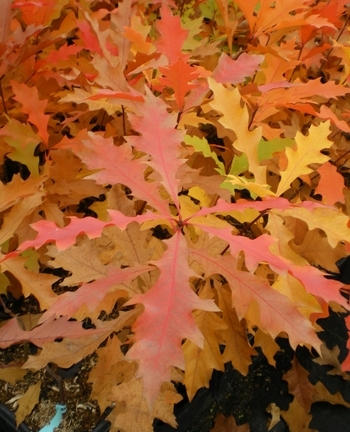 Guy Sternberg, Starhill Forest Arboretum, introduced this fine oak hybrid in recent years. Tight branch habit, straight stems, and columnar form. Here in Oregon the persistent golden winter foliage contrasts with the typical russet of oak or beech leaves. Selected at Starhill Forest Arboretum by Guy Sternberg for it's good columnar habit and exceptional fall color. Here in Oregon we have noted it's ability to grow very rapidly but with straight stems, while other columnar selections have the habit of having wavy growth similar to Q. robur fastigiata. Indeed the fall color is a stand out of among oaks for us, with yellows, orange and some red. The retained winter foliage is darker by several shades when compared to other oaks. Also selected at Starhill Forest Arboretum by Guy Sternberg for its narrow and upright growth. The much shinier foliage is a little smaller than the other sections with smaller lobes. 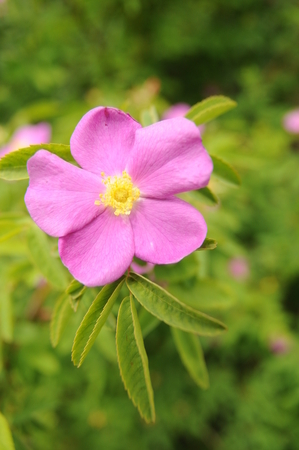 With few prickles on its stems and clusters of pink flowers, this wild rose thrives in lightly shaded locations and is a good candidate for the ornamental garden. BC south to Northern CA. Sassafras is aromatic in all its parts. Historically, it has found medicinal uses and was the raw ingredient used to make “root beer”. It surely found its way into “moonshine” for some spicy flavoring. 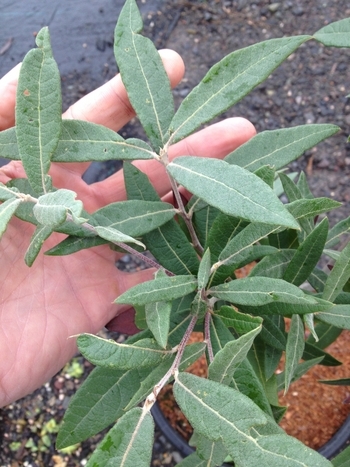 Its foliage is distinctive with 4 different shapes: right and left-handed mitten, un-lobed, and tri-lobed. Difficult to propagate reliably, it is nevertheless a trouble-free native American tree once established in the landscape. Often suckers if it is disturbed. Occurring in groves of small trees, along fence rows, and in abandoned fields in its native range; if it grows on its own in the open it can reach a height of 60 ft. with a 2-3 ft. trunk diameter. Needless to say, trees of this size are now rare and merit protection. Soft needles, pleasing form, and kind of pre-historic in its overall appearance, Umbrella Pine is somewhat slow-growing, but always in demand from those suppliers who invest in liners annually and hold them for 4-5 years. Best if not crowded or planted in a wet spot, or simply "let go". This is an expensive plant to buy but a profitable one to sell if you're patient and want to offer something other than red maples, crabapples and honeylocust. Under appreciated for its very show pink flowers that attract multiple pollinators. This is a integral part of our wetland habitants in the West. Willamette Valley ecotype for use in revegetation. A crowning jewel for the connoisseur's garden. Tall Stewartia differs from the larger, more commonly encountered species Stewartia pseudocamellia with its smooth, reddish brown bark and smaller leaves, Flowers are more abundant and smaller. Charming muted maroon fall color, even in the South. 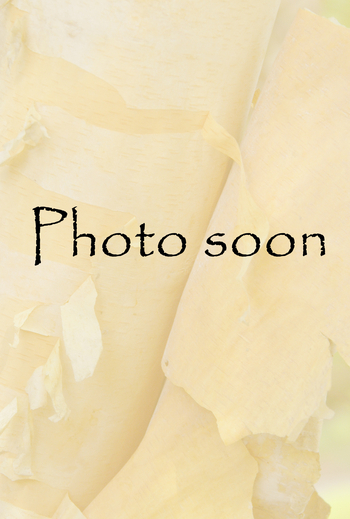 This tree is perfectly planted in afternoon-shaded loose, organic soil or near a woods edge. Alongside an old rotted tree stump is perfect. It will NOT tolerate wet or compacted soil in the immediate vicinity of home or street construction. Yet, with thoughtful planting care and judicious watering practice, few small trees are as tastefully gracious in their full-season garden appeal. Among the most desirable of all deciduous landscape trees. Camellia-like flowers in early summer. Striking bark patches that resemble pieces of a puzzle. 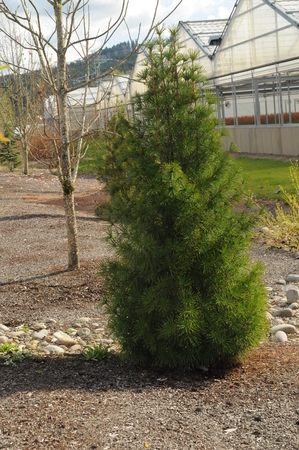 Diminutive mature size, ideal as a small specimen tree. Red, yellow, and orange autumn leaf colors. 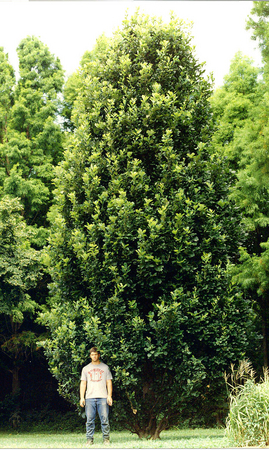 This taxon is the ideal landscape tree - the complete package. Our strain is originally from the vicinity of Nikko Park in Japan, and has survived the extremely harsh winter lows of the UP in Quinnisec, Michigan. We're talking 35 below zero! Check out their amazing root systems, pot up or plant them out, and make some money. 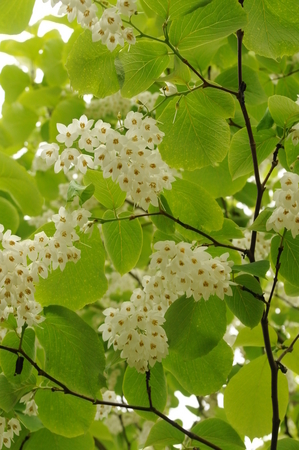 Small leaves and profuse white, bell-shaped June flowers. Best planted where the masses of pendant blossoms may be seen from below, such as along a rock wall or embankment. Pest-free, hardy, and rapid-growing. Occasional pruning when it is young encourages an open branch habit so that its flowers are more easily seen. 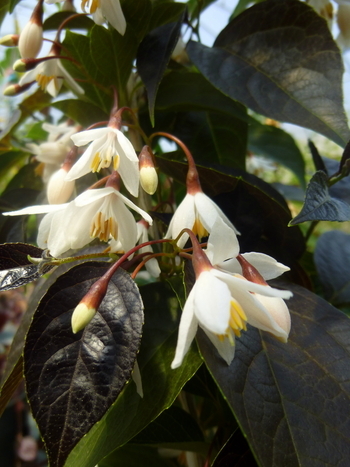 The very limited supply of this plant serves to create a aura of mystery and in this case, wow, it is worth waiting for; foliage of a lovely chocolaty purple sets off fragrant white flowers. Small stature, precious blossoming, and pest free nature all lend a high degree of usability to Japanese Snowbell. Leaves with fuzzy underside, much larger than those of the far more common S. japonicus. Superb, fragrant flowers dangle in long showy clusters. Open branch habit; ultimately twice as tall as S. japonicus. Requires full sun and well-drained soil. 2-4 ft. shrub native across a broad swath in the upper latitudes of North America. 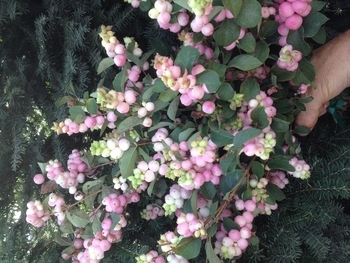 Small pink flowers emerge in summer followed by white berries in the fall. Hummingbirds are attracted to the flowers. Its strong root system makes this shrub useful to control erosion on steep slopes of an embankment. Tolerates wet soils as well, so it is frequently used in riparian restoration. Used as an ornamental, easy to grow and gratifying with its persistent winter fruits. Occasionally head it back for best ornamental performance. Magical Pride is a well-branched, upright form with plump, dark-pink berries that cluster along the stems. Plant in mass or use as a stand-alone specimen where needed. Excellent for cut stem, floral display. With its tree-like form and lack of pest and disease problems, it has a secure place as a specimen tree in the landscape. Hardy and adaptable, it is best planted in full sun. Weaker branches should be thinned occasionally to highlight the strongest branches of its handsome form. Handsome foliage and abundant creamy white flowers. Grows to 20 ft., but does not tolerate hot, dry sites well. Iconic lilacs - everybody's grandma had one, but this selection has a compact form; giving it strong modern appeal across a wide range. Memorable, pleasant fragrance. In addition to its expected cold-hardiness, Tiny Dancer™ boasts remarkable heat tolerance, growing and blooming well in the South. Even in Zone 8, violet-purple buds open into lavender flowers, joining dogwoods and azaleas as a marker of spring. 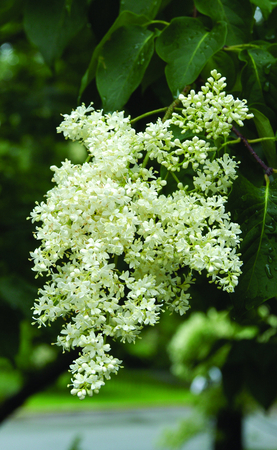 Large panicles measure 4 to 5 in., the big florets making each cluster appear luxuriously full. Foliage and flowers are in perfect scale, one complementing the other. You know the feeling when everything is in balance with a plant: it exudes quality. We're inspired to bring Tiny Dancer™ to you, an updated version of an old classic for today's gardens. Selected and named by Earl Culley, the original plant was planted sometime in the 1830s by an German immigrant family along the old National Rd in rural Norwich, OH. Still growing strong and is easily hardy to minus 28F; with 180 years of weather records we have solid evidence. 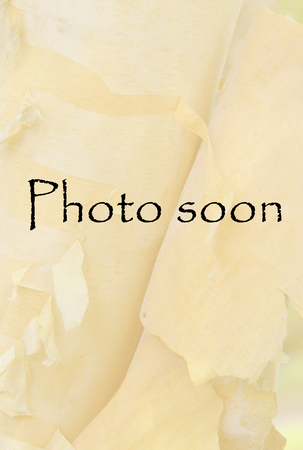 It is one of the hardiest selections of pond cypress.